Get the entire family out and about with these top 10 family-friendly activities featured in Tahoe Magazine. Winter at Lake Tahoe and Truckee provides the perfect opportunity for families looking to let loose at one of the coolest outdoor playgrounds in the world. Whether your kids want to spend all their time on the slopes, or none of it, there’s a plethora of family-friendly indoor and outdoor adventures to cure cabin fever for good. Check out our list below of the top 10 activities – in no particular order – for families to experience during their winter vacation here at Lake Tahoe. 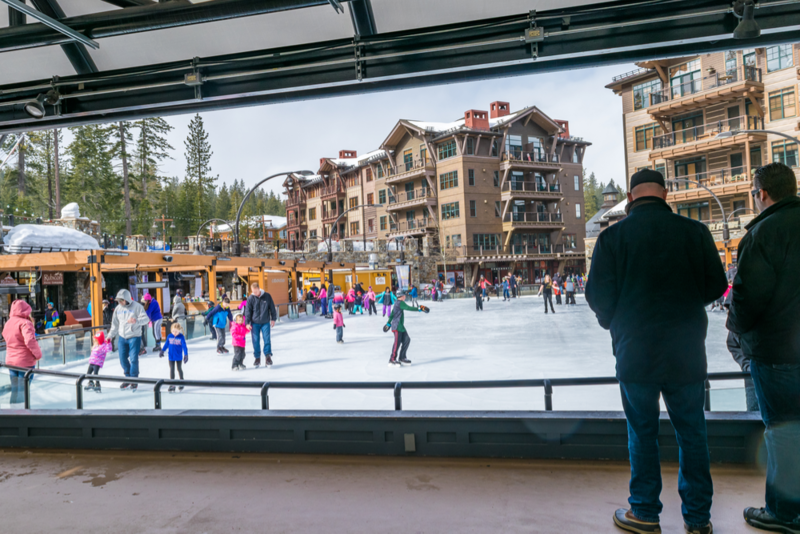 Northstar California’s 9,000-square-foot iceskating rink is located in the heart of the resort’s Village. Mom and dad can sip on a cocktail and warm up by the fire at one of the surrounding fire pits, while kids take a break from the rink to roast s’mores. Meanwhile, the ice rink at Truckee River Regional Park, located a half-mile south of downtown Truckee, offers public skating, rentals, private lessons and various ice-related activities. Or, no matter the season, check out the South Lake Tahoe Ice Arena. It’s Tahoe’s only year-round, indoor ice arena, and it offers various lessons and programs. Further, daily public skate sessions are available, including night skate sessions on the weekends; head to www.tahoearena.co for prices and more information. Tahoe Donner’s Snowplay tubing hill is a fun way to enjoy the slopes without the fear of falling down. At Snowplay, there’s fun to be had on and off the tubing hill with snowman building contests, snow-bowling competitions, night tubing, snowball-launching challenges and other family events. Granlibakken’s sled hill in Tahoe City is the perfect playground for kids of all ages, and best of all, kids under the age of 3 sled for free. Hansen’s Snow Tube and Saucer Hill takes the cake with its giant 400-foot tubing hill, which is groomed daily. For non-skiers who want to experience the scenery and adrenaline that Squaw Valley has to offer, there’s an indoor 30- foot climbing wall, as well as Sky Jump at the base of the tram in the village. Located a short drive from Truckee is Woodward Tahoe’s indoor facility at Boreal Mountain Resort, known as “The Bunker,” which features an indoor skatepark, foam pits, trampolines, a state-of-the-art Digital Media Lab and more. For true adrenaline junkie families, get your young ones on the climbing wall at High Altitude Fitness in Incline Village. Whether your child is a seasoned climber or completely new to the sport, the knowledgeable coaching staff at High Altitude will help find the perfect program for you and your family. Article Source: Goldsmith, Jenny. “Top 10 Ways for Families to Enjoy the Perfect Tahoe Winter Day.” Tahoe Magazine, 2018, pp. 86–89. 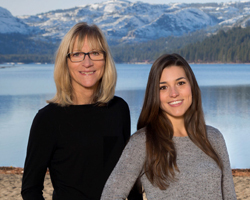 Chris and Ally Carroll, a mother, daughter duo embody the true spirit of Tahoe. You may see them on the slopes or kicking around town. The recreational lifestyle is what brought Chris Carroll to Tahoe more than three decades ago. She loves the area and is a steadfast supporter of the community. 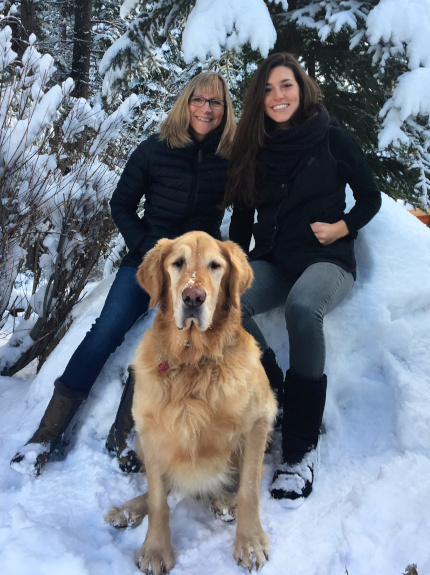 Ally, a champion snowboarder was born and raised in Truckee, she too holds a deep appreciation for the community and the town’s rich history. When she isn’t selling houses, you may find her up on the slopes enjoying the snow. Chris and Ally’s dedication and exceptional knowledge of Tahoe makes them excellent realtors. With great communication skills and professional follow-up methods, comfortable style, and an honest straightforward approach, they will have your transaction of buying or selling done in a smooth and stress-free manner. If you are thinking of buying or selling a home, the Carroll Team is always available to provide excellent and dedicated service.